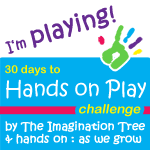 This is an open-ended creative play challenge, involving just one key element- stickiness! My daughter had a ball with some frosting painting and gluing. I made frosting (just powder sugar and milk with a drop of food coloring for color) and she got to paint with it and then stick lots of fun random embellishments on to create a masterpiece. Titus watching his sister and eating and playing too! Yep, she got in as many tastes as she could. We also used ribbon, guitar picks, felt stars, cut up paper, and a wrapper from her pop tart (breakfast)! She created 3 faces...how cool! Titus was in his high chair and he got to "paint" with his baby food. A little peas and some beef n gravy and he was having a good time. Play a little, eat a little! I am still cleaning up but it is all worth it. The kids are all bathed and cleaned and taking a nap. Now it is of to mop the kitchen floors...they needed it before we started so I figured lets go ahead and get messy and sticky!